"Row the Boat Ashore", 11" x 14", o/c. 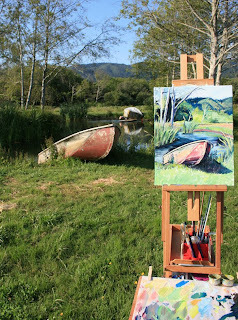 I had the luxury of painting on a Marin Organic farm in Bolinas, CA this afternoon with the Art on the Farm group of plein air painters. 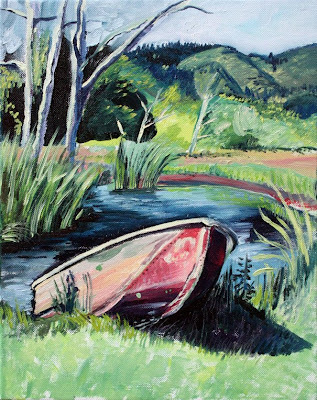 This is a painting of a row boat on a duck pond, in front of the Bolinas Ridge hillside, at Gospel Flat Farm. It was a beautiful day, perfect weather to paint, and spend the afternoon with ducks, chickens, rabbits, a girl named Anna Rose, and painters in their element. I can't believe you did this in one visit, It's lovely. I wish I had more walls.